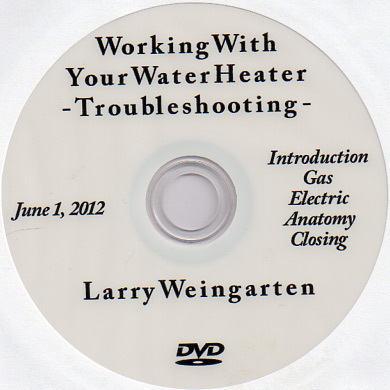 Larry Weingarten, co-author of the Water Heater Workbook, takes you through two hours and ten minutes of hands-on learning about tank-type water heaters in the field. Gas, where you are shown how to look at a gas fired heater to see what clues it gives you, how to spot and fix problems and how to keep it going. Electric, where you are shown details of how a heater is supposed to work and just what to do when it doesn't. Also the section covers practical safety, tank longevity and how to make plumbing behave as you want it to. Anatomy, shows the inner workings of a heater to help you understand the various parts, what they do and what happens when things fail. In particular, anyone with an electric water heater should have this video, because there are more ways to find yourself without hot water than with a gas heater and the video will help you pinpoint the problem and fix it. The video is filmed in the real world rather than in a studio. You get to see actual examples of heater problems and how to think about and deal with them in the most cost effective way. Low-key humor and some surprises along the way make what could be an overly technical topic easier to digest. Have a look at this 12-minute video on U-Tube to get a feel for what to expect.